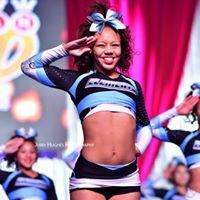 All Star Cheer is a competitive cheerleading program that competes with other All-Star programs from around the nation and even around the world. Instead of cheering at games or for teams, All Stars train for competition. All-Star routines incorporate many different elements such as tumbling, dance, stunting, and jumps. These action-packed 2 min 30-sec routines are designed to highlight the skills of the athletes. All-Star cheerleading is all about teamwork, since you may share the competition floor with 4- 35 other athletes, one person can affect the rest of the team, so it is very important that new members understand that All-Stars is a time commitment for the entire season. Our All-Star program is a full season (12 months) competitive program that competes at both local and out of state competitions. All-Star Teams practice 2-3 days per week and compete at 5-7 competitions per season. Ages 7-18. All Levels. No experience required. Everyone makes a team.